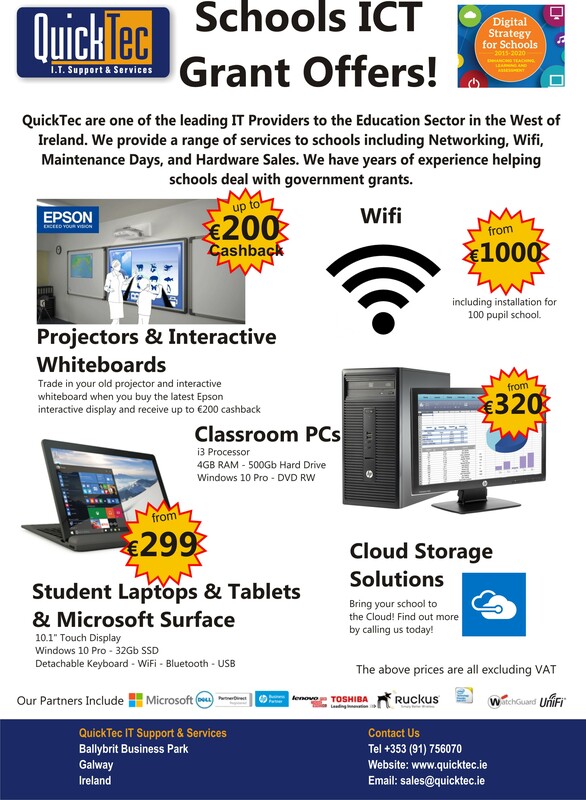 QuickTec IT Support and Services are one of the leading IT Providers to the Education Sector in the West of  Ireland. We provide a range of services to schools including Networking, Wifi,  Maintenance Days, and Hardware Sales. We have years of experience helping  schools deal with government grants. See our offers below on projectors and interactive whiteboards, Wifi, classroom PCs, laptops, tablets, Microsoft Surface, Cloud Storage Solutions. including installation for 100 pupil school. Bring your school to the Cloud! Find out more by calling us today! Call us on 091-756070 to enquire further about other IT Services or how we can help you with your ICT grant. This week the Irish government announced that it had released €30 million to Irish primary and secondary schools in their Grant Scheme for ICT infrastructure as part of the implementation of the Digital Strategy for Schools 2015-2020 Enhancing Teaching Learning and Assessment. • Local After Sales Support- IT requires management, buying from your local IT provider means that they can manage and repair your equipment over the years as needed. • Better Prices – consider all aspects of the cost of the equipment including installation and delivery, your local IT provider may come in at better value than those on the purchasing frameworks. • Convenience, reliability and speed – once all schools start ordering off the purchasing framework there could be delays in getting equipment and engineers out on site from large volume orders on these vendors.